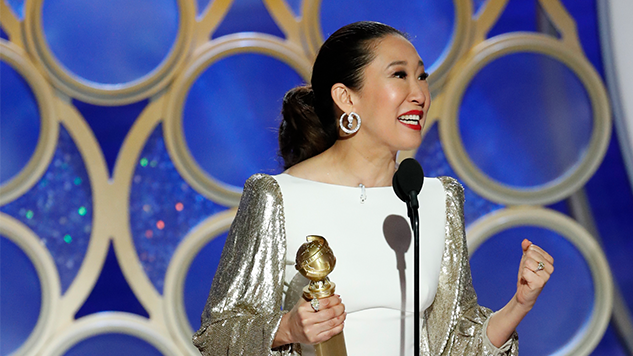 At Sunday night’s 76th Golden Globes, Sandra Oh was the big winner, marking multiple firsts for people of Asian descent and standing out as one of the most captivating hosts the Globes have had in years. Oh became the first Asian performer to garner multiple Golden Globes with her victory in the Best Actress—Drama Series category for her lead role Killing Eve, per EW. The Korean-Canadian actress previously won Best Supporting Actress for her part as Christina Yang in Grey’s Anatomy. If I could take a moment here … In all honesty, I said yes to the fear of being on this stage tonight because I wanted to be here, to look out into this audience and witness this moment of change. And I’m not fooling myself, I’m not fooling myself. Next year could be different—it probably will be—but right now, this moment is real. Trust me, it is real. Because I see you. And I see you. All these faces of change, and now, so will everyone else. Some of these faces of change included nominees Constance Wu (Crazy Rich Asians), John David Washington (BlacKkKlansmen) and Regina King (If Beale Street Could Talk), to name a few. And while the results were (in general) fairly disappointing, Oh’s win shines bright. The 47-year-old took a moment to thank her beaming parents in her acceptance speech, saying in Korean, “Mom, Dad, I love you.” A daughter of immigrants, expressing love to her parents in their native language in an age of renewed xenophobia? We damn sure teared up on our sofas at home. Oh is the second-ever woman of Asian descent to win in the Best Actress—Drama Series category, after Yoko Shimada was recognized nearly 40 years ago for her role as Mariko Toda on Shogun. Congratulations to Oh, one of Paste’s foremost winners from this year’s Golden Globes, and let’s hope that this is just the beginning of increased representation at awards shows. See the complete list of this year’s Golden Globe winners here.